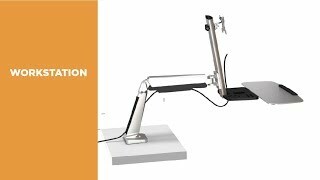 The sit-stand workstation desk mount effortlessly converts your existing workstation into a standing desk, enabling you to achieve long lasting health benefits. Move from sitting to standing in mere seconds with our easy-to-use gas spring arm system. To be more productive, focused and less stressed in this new working style.